Preheatoven to 160°C. Place the butter, caster sugar and ½ a teaspoon of the cinnamon in the bowl of an electric mixer and beat for 6 minutes or until light and creamy. Gradually add the eggs, one at a time, beating well after each addition. Add the flour and milk, and mix to combine. Line the base of a 22cm springform cake tin with non-stick baking paper and lightly grease the sides. Pour the cake mixture into the tin. Cut thin, deep slits into the top of each apple half. Arrange the apple, sliced-side up, over the top of the cake mixture. Place the granulated sugar and remaining cinnamon in a small bowl and mix to combine. Sprinkle over the apples. Place in the oven and cook for 50–55 minutes. Brush the warm jam over the cake and return to the oven for 10 minutes or until cooked when tested with a skewer. Brush with extra jam to serve. Serve warm. Serves 8–10. + When you’re making slits in the apple halves, cut most of the way through. 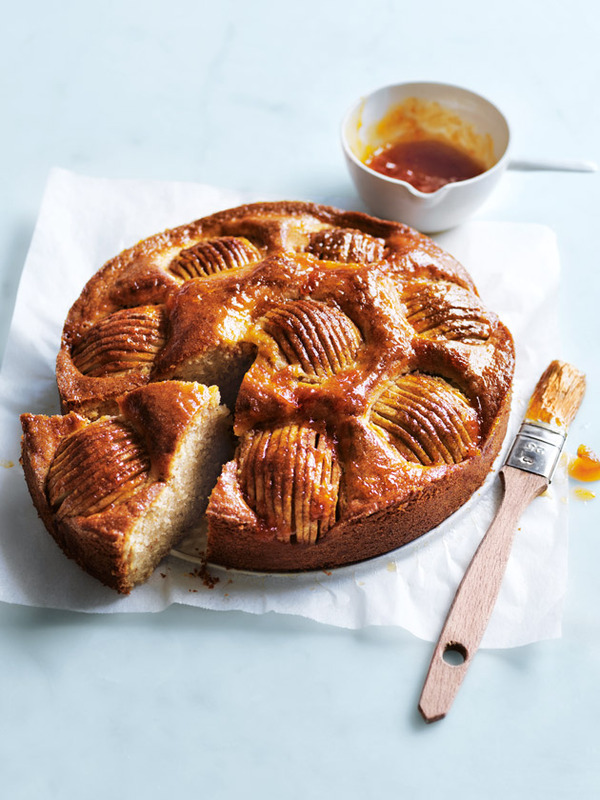 Deeper cuts will help ensure the apple is soft once the cake is cooked.